Barring a minor glitch in the second game of the match, the Bulldog volleyball team made efficient work of Lovington Tuesday at Bulldog Pit to open the “second season” on a high note. Their inaugural District 4-AAAA bout was also Artesia’s first competition since Oct. 6, but the girls in orange showed only a few signs of rust in a 3-1 victory over the Wildcats. Williams said the Bulldogs worked diligently to prep for district over the course of their 10-day layoff but were anxious to see how that preparation would translate to the pressures of an actual match in their first meeting of the season with Lovington. Artesia came out strong in the first set Tuesday, executing their offense and letting the ‘Cats make many of their own mistakes as they jumped out to a 17-11 lead. 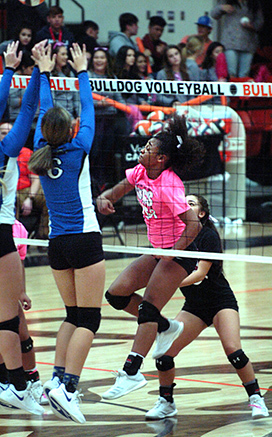 Kyrah Gonzales served the ‘Dogs to the 20-point mark with help from kills by herself and Malori McSpadden, and Elliot Harrison would serve out the contest with Lovington twice sending hits into the net and game point out of bounds in Artesia’s 25-12 win. The Wildcats came out with a bit more fight in the second game, however. The Bulldogs were able to maintain a slight lead through the early goings, 8-7, but defensive errors began to add up, allowing Lovington to slide in front for good in a single service, 12-8. With two points apiece from the line by Paityn Houghtaling, Harrison and Kersie Beltran, along with some well-placed kills and blocks by Dezaray Boyce, Houghtaling and McSpadden, the ‘Dogs were able to tie things up once and pull within one twice en route to game point, 22-24. A block out of bounds, however, allowed the ‘Cats to tie the match at one-all, 25-22. Artesia by no means took the setback lying down, barreling onto the court with renewed gusto in Game Three. A seven-point service by McSapdden early – which included a pair of aces and a Boyce kill – put Lovington firmly on their heels, 11-1, and the girls in orange were essentially able to set the cruise control from there. Three service points apiece from Boyce and Houghtaling and a pair of Harrison kills put Artesia in front 21-6 late, and Harrison would serve out the bout in the 25-8 victory. Another solid service by McSpadden in Game Four – this time a five-pointer – once again gave the Bulldogs an early leg-up, and following a Boyce ace and a Houghtaling kill midway through, Artesia found themselves on top 15-9. Two from the line by Gonzales, including a resounding spike to the court by McSpadden, made that 18-10, but a rash of side-outs would slow the momentum slightly through match point. A kill by Harrison, however, ended the Wildcats’ final service, and Houghtaling served up the evening’s final point, 25-15. “I thought we hit the ball well last night,” said Williams, “and we also did a good job with our serving. “In the game we lost, I think it wasn’t one particular thing that cost us but a lot of little things put together, mainly focus issues. But we came out in that next game and decided to show what we could do. The Bulldogs (12-3, 1-0) will head to the Alien City Thursday for their third meeting of the season but first in district play with the Goddard Rockets. Artesia defeated Goddard in three straight games at both the Zia Classic in Roswell Sept. 22 and the Rio Rancho VolleyBash Sept. 29 but now the Rockets will be gunning for them as the battle for the district crown begins. Goddard currently stands at 8-6, 1-0 on the season after a 3-0 win over Portales last night. “We’re real familiar with them, as they are with us,” Williams said. “I think the key to Goddard is going to be consistency – consistent serving, consistent passing. What we can’t do is send over weak balls, because they’ll punish us with their big hitters if we do. Williams also expressed appreciation to the Artesia High School Student Council and all fans who donated funds during the Bulldogs’ Pink Out match Tuesday in support of Breast Cancer Awareness Month.